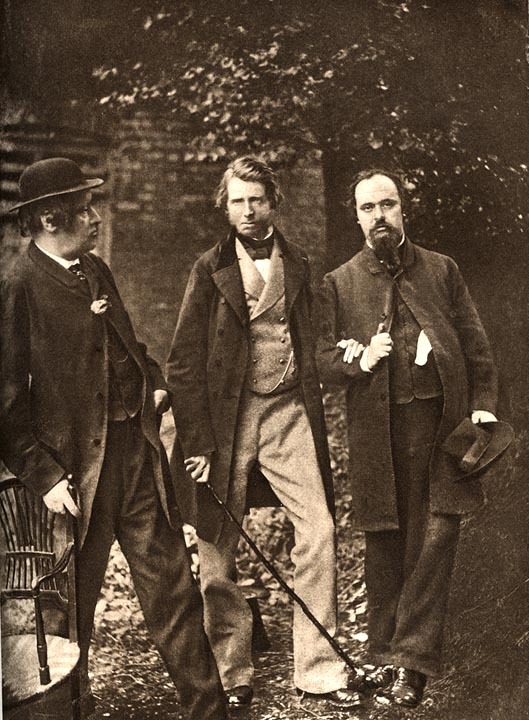 Downey made made this triple portrait during the same session at Rossetti's house (16 Cheyne Walk) he photographed Ruskin and Rossetti in Rossetti's painting chair. The photographer posed his subjects in Rossetti's garden (which Beerbohm so delightful caricatures). Maas comments: "Rossetti's handkerchief hangs out sloppily and he stands awkwardly; and, furthermore, Downely objected to the menacing way Ruskin held his stick." (Ruskin and His Circle, 24). Bartram, Michael. The Pre-Raphaelite Canmera: Aspects of Victorian Photography. London: Weidenfeld and Nicolson, 1985. John Ruskin and His Circle. Exhibition catalogue: London: Maas Gallery, June 1991. No. 24. Maas, Jeremy. The Victorian Art World in Photographs. London: Barrie & Jenkins, 1984.